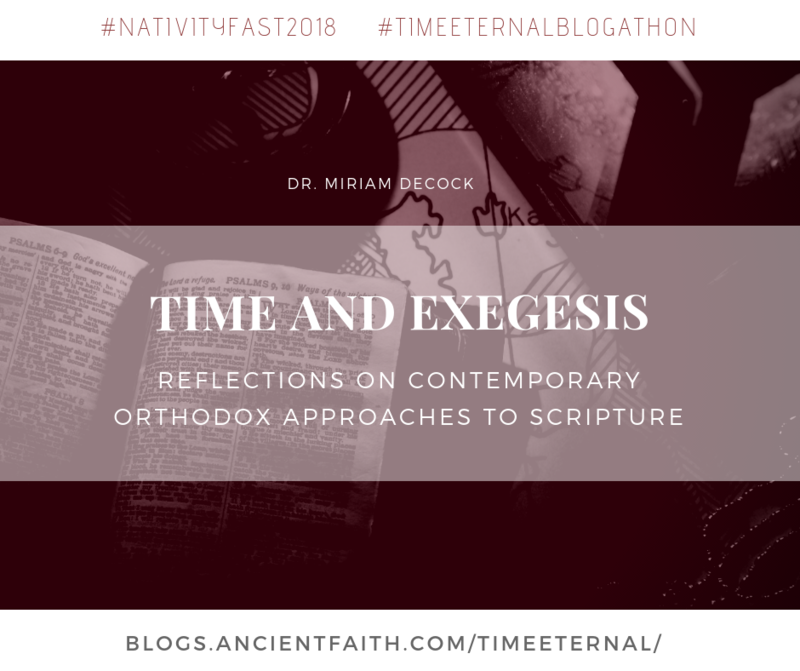 How are the Orthodox to engage with the exegesis of patristic authors today? What place should the methodologies and insights of modern historical criticism occupy in our approach to Scripture? Perhaps, at first glance, these questions appear unrelated to the theme of time. However, I want to suggest that many of the recent attempts to answer these questions reveal a somewhat inadequate understanding of our relationship to time, given our place in history. It seems to me that among Orthodox scholars, answers to this twofold question tend to fall across a spectrum with two extreme poles. At one extreme the exegesis of the Church Fathers takes permanent pride of place. Although scholars rarely make this argument explicitly, we consistently encounter this kind of thinking in our churches. The risk, here, is that we may begin to privilege the past in a way that fails to account for either the hermeneutical developments since the “golden age” of the Fathers or the considerable distance between the late antique mind and our own. In effect, history (or at least our perception of it) can become frozen in the early centuries. On the other end of the spectrum are those who argue that the historical critical method, while imperfect, is the best available approach to Scripture, and should therefore supersede all earlier approaches (e.g. Kesich, 1972). This “presentist” attitude runs an equal but opposite risk as privileging the past, for it overlooks the historical circumstances that gave rise to the historical critical approach itself, not to mention that it undermines the authority of Church Tradition. It also suggests that the Church Fathers were not interested in history, which they certainly were, even if in ways that we do not recognize as decidedly historical in the modern sense. As we might expect, however, most Orthodox scholars rightly fall somewhere between these two poles, arguing that some combination of patristic and historical critical methodologies is preferable (e.g. Hopko, 1970; Louth, 1983; Breck, 1983, 1986, 1996; Stylianopoulos, 2002; McGuckin, 2002; Pentiuc, 2014; this is not an exhaustive list). There seems to be a general consensus that, as a post-Enlightenment church, the strengths and insights of historical critical research ought to be incorporated into our interpretive tool kit, although few have specified what those may be, and fewer articulate how the two methods might interact. One way historical critical methods have benefited Orthodox approaches to Scripture involves the insights that study of the original languages of biblical texts shed on the historical development of key terms (Louth) and concepts (Stylianopoulos). Similarly, others maintain that, in certain respects, the historical critical approach’s “hermeneutic of suspicion” is helpful to elucidate otherwise overlooked historical realities, such as the role of women in the early church (McGuckin). To this list, I would add an example from recent New Testament scholarship: the situating of New Testament books within the context of contemporary early Jewish writings such as the apocrypha, pseudepigrapha, and the Dead Sea Scrolls. Such comparisons aid us in our understanding of the early (Jewish) Christians’ interactions with contemporary Jews’ scriptural interpretation, Torah observance, synagogue participation, as well as messianic, eschatological, and apocalyptic thought. These topics have direct bearing on the New Testament, and these comparisons can help prevent us from providing unnecessarily ignorant, and sometimes anti-Semitic readings of it. I would therefore suggest that at least in our treatment of the literal level of Scripture—I do not need to convince the majority of Orthodox of its multiple levels—we cannot afford to neglect the insights of historical critical research. However, because we also take seriously other levels of interpretation, such as the moral, spiritual or mystical, we likewise cannot afford to stop at the literal-historical level either. To neglect either is to risk misinterpreting our exegetical place in time. The reality of our present situation as Orthodox in the West is that genuine interaction with other Christians is vital, and some non-Orthodox scholars have been grappling with what to do with historical critical research for much longer than we have. I suspect we Orthodox would do well to consult the work that non-Orthodox Christians have already done. Rather than assuming that Catholics and Protestants have their approach to these questions all wrong, as we Orthodox sometimes unfortunately do, what if we saw this topic as a potential avenue for genuine ecumenical exchange? Why not consider interacting seriously with, for example, the Catholic Church’s official statements on ecclesial exegesis, such as the Pontifical Biblical Commission’s 1993 statement (Williamson, 2003), or with Catholic patristics scholars, such as Brian Daley, who has asked similar questions about the place of patristic exegesis today (Daley, 2002)? In fact, Daley proposes (rightly in my view) that one of the strengths of putting the historical critical method in conversation with ecclesial exegesis is that it allows for ecumenical exchange. He engages with thinkers from the Church of England, such as the Episcopalian Ephrem Radner and the 19th-century thinker, John Keble. Likewise, our own Andrew Louth engages with the thought of John Henry Newman and Brevard Childs, and cites the 17th-century Caroline Divine author Jeremy Taylor’s Life of Christ as an example of the fusion of patristic and historical critical reading strategies. There is much work to be done, both in terms of fusing the most appropriate insights of both patristic exegesis and historical critical research, and in terms of the working out of the theoretical questions with respect to specific biblical passages. To do this well, we need to recognize our exegetical place in time, and the temporal dimension of scriptural interpretation. Breck, The Power of the Word in the Worshipping Community (Crestwood, NY: SVS Press, 1986). ______, “Exegesis and Interpretation: Orthodox Reflections on the ‘Hermeneutical Problem’” (SVTQ 27.2, 1983), 75-92. ______, “Orthodox Principles of Biblical Interpretation” (SVTQ 40.1-2, 1996), 44-73. Daley, “Is Patristic Exegesis Still Useful? Reflections on Early Christian Interpretation of the Psalms (Communio 29.1, 2002), 185-216. Hopko, “The Bible in the Orthodox Church” (SVTQ 14:1-2, 1970), 3-36. Kesich, The Gospel Image of Christ: The Church and Modern Criticism (Crestwood, NY: SVS Press, 1972). Louth, Discerning the Mystery (London, OUP, 1983). McGuckin, “Recent Biblical Hermeneutics in Patristic Perspective: The Tradition of Orthodoxy” (GOTR 47.1-4, 2002), 295-326. Pentiuc, The Old Testament in Eastern Orthodox Tradition (Oxford, OUP: 2014). Stylianopoulos, “Perspectives in Orthodox Biblical Interpretation” (GOTR 47.1-4, 2002), 327-338. Williamson, “Catholic Principles for Interpreting Scripture” (CBQ 65.3, 2003), 327-349. 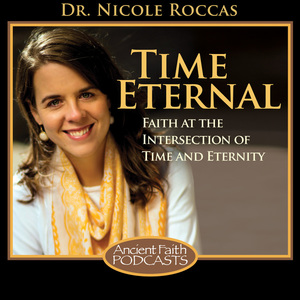 Miriam DeCock has a PhD from McMaster University’s Department of Religious Studies in the field of Early Christianity. 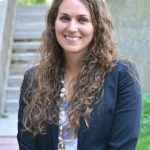 Her thesis is entitled “Alexandrian and Antiochene Exegesis and the Gospel of John.” She is currently living in Edmonton, Alberta with her husband Caleb, and attends the OCA parish, St. Herman of Alaska’s Orthodox Sobor. In February she will begin a Marie Curie postdoctoral fellowship at Aarhus University’s Theology Department in the School of Culture and Society where she will work on Origen’s recently discovered Homilies on the Psalms. Your bio says, that you’ll be in Aarhus, Denmark from February. This is where I live, and my parish celebrates Vespers & Liturgy here (in danish though). If you go to http://www.ortodoks.dk you’ll find my contact info, and I can tell you more. Thanks Robert, I’ll make sure Miriam takes a look at this comment! Wonderful! So glad someone is talking about this! Although Richard Swinburne can be much maligned in Orthodox circles, his book Revelation is a wonderful look at scripture as a text of The Church . He comes to roughly the same conclusions as Louth, which is remarkable, given that Louth comes from a continentalist perspective (philosophically) and Swinburne from an analytic. For a non-Orthodox “Orthodox” view on this, Nicholas Woltersorff’s work Divine Discourse is also excellent. Fr John Behr’s forthcoming book on the gospel of John will be a fascinating addition to this list as well. His book The Mystery of Christ fleshes his view out a little bit. I personally find Behr, Breck and Swinburne the most helpful. I’m contemplating doing a dissertation on an Orthodox view of scripture in light of historical-criticism, so if Dr. DeCock could email me (can YOU view my email? I know it says our email is not published), that might be helpful. I’m wondering if she knows of anyone that would be interested in overseeing such a project. I know it’s far too broad a topic, but I want to at least start from there. By the way, I miss the blog Departing Horeb. After Fr Tom of blessed memory passed, it was the only thing on Ancient Faith dealing with these questions. I hope there’s more to come.